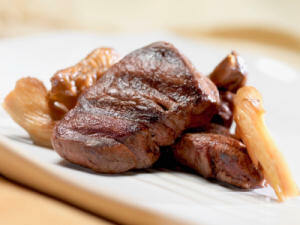 Back to the Venison Recipes home page. This was wonderful-moist, tasty. I used a much smaller piece of meat and cut the portions of seasoning, still cooking to 150 degrees. I also used a much smaller cut of meat and cut the seasonings appropriately. Meat was juicy and tender, even the 2.5 yr old grandbaby couldn't get enough of this tasty roast. Outrageous! Perfect blend of seasoning and a fantastic gravy. Motivated the boys get another deer next season! Very good, but I think I overcooked it a little. Average rating of 4.80 stars based on 5 reviews. A berry and wine reduction sauce finishes off these golden venison chops with a sweet, round touch. Serve this crispy, pork-infused roast with mashed potatoes, steamed asparagus, and a glass of red wine. Pork-lovers beware, you will go hog wild for this amazing dish!